I thought of the BEST U date this past week. There is a U-Pick Strawberry field about 5 miles from the house and I KNEW that not only would we have a great time, but it would be SCRUM-DIDILY-UMPTIOUS as well!! Growing up in Michigan, we often went to Apple Orchards, but I never remember going anywhere to pick my own strawberries. Yes, climbing trees to get apples is fun (shoot, we even did it for our A Date), but picking these California berries was a grand-ol'-time as well (not to mention we were like a mile from the beach, which wasn't bad scenery either :)). The Carlsbad Strawberry Company has quite the good thing going on. The little stand in the parking lot sells pre-picked strawberries (there were actually quite a few folks that were just driving up and buying the ones that were already in boxes), flowers, and empty containers. Ryan being "artsy" with the camera he is borrowing from work. We opted for the empty container, seeing as we need to fulfill the "U" portion of our date and pick our own. We got the BIG DADDY bucket (my name for it, not an official title), which was similar size to a extra large popcorn tub that you get at the movies. Then they sent us off. There were a few rules (no hoping the rows, no overflowing your bucket, no pulling the stems, etc), but other than that they just let us roam the hill. 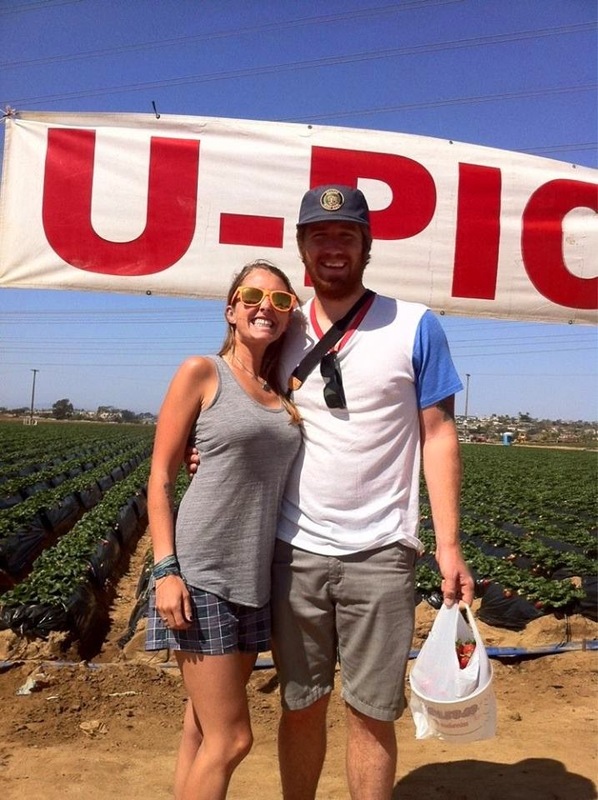 On our way out we asked a lady to take our picture under the U-Pick sign. She cut off a bit of it, but at least she got the "U" in there!